Well, the reader will surmise from perusing the headnote about this DVD that it is an account of an historical event. It isn't just a concert, then. Some potential buyers, however, will only be interested in the recording if it is musically of merit. Others will want it for its religious or historic significance. 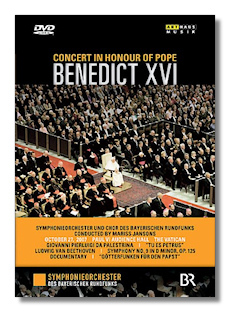 On the latter count, the DVD is priceless: you get to see the Pope, who sits partway up the center aisle during the performance and speaks afterward the concert for twelve minutes. You also get many snatches of him during the performances. (By the way, he is supposed to be a fairly good pianist.) The video portion of the production is excellent, vividly capturing the Pope, the various speakers, the conductor and the orchestra and singers in proper perspective. But, you ask, what of the performances? I read a review of them on a respectable internet site that was highly critical of the Beethoven 9th, which is obviously the centerpiece here. Jansons, who is a Lutheran by the way, is not known for his Beethoven, but to me he scores a clear triumph in this recording. The first movement is taut and full of spirit, and features fine playing by the Bavarian players. The Scherzo is less driven than many modern performances, but it works quite well. Jansons infuses it with greater weight, almost a muscularity of sorts. Yet, the music thrives amid the darker, heavier approach: let's face it, this and the other movements of this symphony can take wing in a variety of interpretations, even unorthodox ones, which is not to suggest that this one quite reaches the realm of the unorthodox. The Adagio is paced briskly and comes across splendidly – slower interpretations of this movement generally don't work, at least for me. The massive finale is impressive, with the vocal soloists turning in fine work. By the way, Jansons virtually stops conducting many times during this performance. He clearly conveys the sense that his players are quite capable on their own, at least when under his supervision. Other conductors have done the same thing – and of course, there are, and have been, orchestras performing without a conductor. In any event, the performance is quite effective, as is the brief Palestrina Tu es Petrus, for chorus alone. The sound reproduction is excellent and the camera work, under the direction of Brian Large, is superb. All in all, this is a magnificent release. Bravo!